The proprietary conductive fabrics produced at Swift Textile Metalizing LLC are used extensively by the aerospace industry in EMI shielding applications. The conductive stretching knit tape shown here consists of a knit nylon tricot tape which is silver coated and laminated. 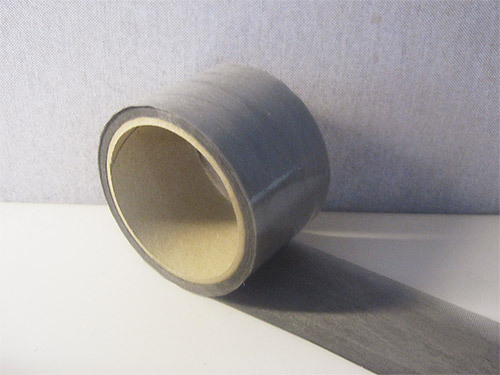 A perforated adhesive backing is attached for tape application. Metalized fabrics provide unsurpassed versatility as they maintain flexibility after the coating process. We can develop custom materials and products to meet any shielding application. For this project, new slitting and perforating processes were developed to meet customer specifications. The nylon tricot is tested throughout the manufacturing process, including before and after metalizing. Slitting widths range from 3 inches to 34 inches (±0.05 inches) depending on the application. We provide this product in lengths from 20 feet to 35 feet with a lead time of 4 to 6 weeks. For additional details regarding this custom aerospace EMI shielding tape, see the table below, or contact us directly.